On July 2, 1959 Plan 9 from Outer Space opened in theaters. Plan 9 is considered by many critics, including Michael Medved, to be the worst film in Hollywood’s history. Plan 9‘s popularity as the worst movie ever made actually has prevented it from ranking anywhere near the bottom of quality metrics. For example, Rotten Tomatoes reports that 66% of critics gave the film positive reviews. In honor of this historic occasion I offer the following four question trivia quiz. (1) What did Ed Wood originally intend to be the title of the movie? 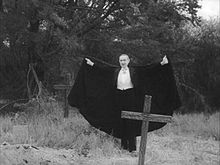 (2) Is it true that Bela Lugosi died on the second day of filming? (3) What popular TV psychic provided Plan 9’s introductory narrative? Answers appear after the jump. The answers are based on information from the ever-authoritative Wikipedia. Probably not, since I cannot find such precise information in the Wikipedia or anywhere else. But it is true that when Lugosi died on August 16, 1956 much of the movie had yet to be filmed. Historians say silent footage of the actor actually had been shot by Wood for other, unfinished projects just before Lugosi’s death in 1956 and was repurposed for use in Plan 9. The film opens with an introduction by Criswell: “Greetings my friends! We are all interested in the future, For that is where you and I are going to spend the rest of our lives! …”. According to the documentary Flying Saucers Over Hollywood – The Plan 9 Companion (1991) it was a plastic toy. Both a regular version of the toy and a somewhat modified one appear in the film. 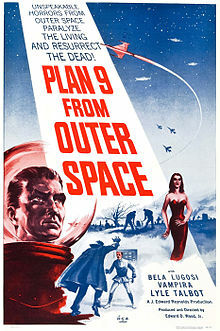 This entry was posted in Like Show Business and tagged Bela Lugosi, Ed Wood, Plan 9 From Outer Space by Mike Glyer. Bookmark the permalink. I’ve never seen PLAN NINE in its entirety, but I have seen TEENAGERS FROM OUTER SPACE all the way through, and I have to say TFOS gives PNFOS a run for its money in the “absolute worst” department…even without Bela Lugosi. or his stunt double. Sam: If you saw it on TV with commercials,that’s not watching the film. Commercial breaks improve lame content. TEENAGERS FROM OUTER SPACE lacks any redeeming unintentional humor, so it is a harder watch. It has one strange plus in that it was someone’s home movie, and was edited and ready for showing. There was no way the distributer would loose money. And in the running as lame (or worse): HORROR OF PARTY BEACH, EEGAH!, BEAST OF YUCCA FLATS and THE CREEPING TERROR. I add as an aside that I received a note from someone years ago who wanted a VHS copy of BEAST OF YUCCA FLATS, because she was related to Tor Johnson.